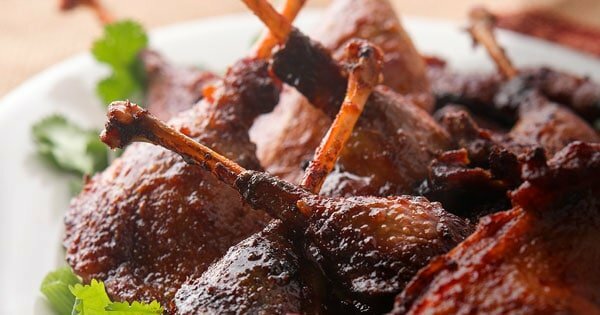 This recipe came out of an experiment I did when I cooked for a gathering of California Waterfowl Association members. I wanted to make my Buffalo duck wings, only I had to use legs instead because that’s what the people who donated the ducks had available. It came out great, I daresay better even than the wings. When I got home I thought about how successful this was and about what other flavors of wings I’d eaten over the years. As it happens, the sweet-spicy-sour-garlicky flavor of sriracha-honey-lime wings is up there with my favorites. Like a lot of Southeast Asian food, it relies on a balance of sweet-sour-savory-spicy that makes it so appealing. What’s more, it’s stupid easy to make — especially now that Sriracha has essentially become America’s new ketchup. Sri-wha? See-Rah-Cha, as it is properly pronounced, is a a Thai and Vietnamese hot sauce laced with sugar and garlic, among other things, that has swept the country, butting heads with the venerable (and very different) Tabasco for the title of America’s hot sauce. I suspect people like sriracha because it’s not as hot as most chile sauces, and it is decidedly sweet. It’s easy to love. At any rate, all you do here is roast the duck legs, mix up the ingredients to the sauce, warm it a little so the honey flows and toss with the duck. Put them back in the oven a bit to caramelize the sauce and you are good to go. Serve this as a party appetizer or a snack, or as a course in a larger meal. You eat them with your fingers, by the way. 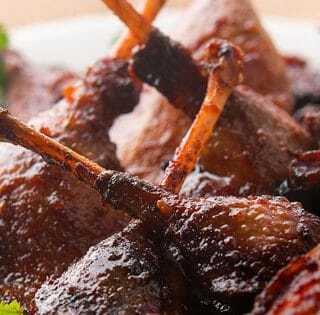 I do this with wild duck legs, but the sauce is tasty on any sort of poultry leg or wing you can imagine. You can also use it as a BBQ sauce for pork. One optional step I recommend with wild duck and goose legs and wings is to braise the wings in some broth until they are tender before you roast. Follow this recipe's technique, but use the sauce below if you go that route. 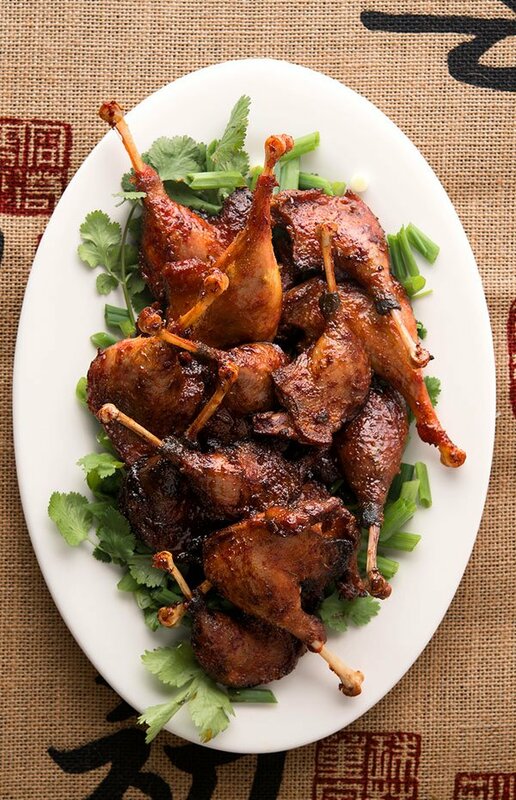 No need to pre-braise domestic duck legs. You want the skin on the legs here, as it adds a ton of flavor and fat. If you have only skinless legs, you will absolutely need to pre-braise them. 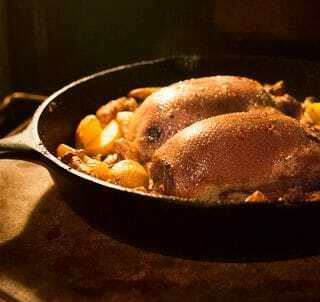 Salt the duck legs well and arrange them skin side up in one layer in a roasting pan or sheet pan. Put them in the oven and set it to 400°F. Don't preheat the oven. You want the temperature to come up gradually so some fat from the ducks renders and moistens the bottom of the pan, so the legs don't stick to it. Roast until tender, about 90 minutes to 2 hours. You might have a few legs that are still tough, but that's part of working with wild food. If you work with domesticated legs, you should only need about an hour. (Note that my oven will take 30 minutes to get to 400°F, so if you have a quick heating oven, start at 350°F for 30 minutes and then jack the heat up.) NOTE: Pre-braised legs will only need about 20 to 30 minutes to crisp up. Meanwhile, mix the remaining ingredients together in a small pot and warm just enough to incorporate the honey. When the duck legs are tender, take them out but keep the oven on. Put them into a large bowl (gently, as the meat will be starting to come off the bone) and pour the sauce over them. Carefully toss to combine and put them back on the baking sheet skin side up and return them to the oven. Keep an eye on the wings, and when you start to see a little bit of char on the sauce, which will caramelize quickly, pull them out. Serve with the remainder of the sauce in the mixing bowl. 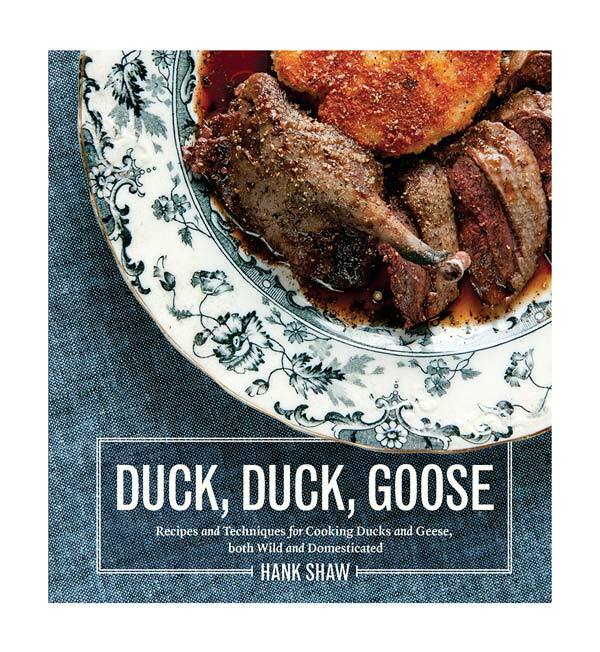 Explore nearly 100 recipes for all varieties of ducks and geese, wild or farmed, here on Hunter Angler Gardener Cook. Way to knock it out of the park with this one, Hank. We scaled back and made this with four Canada Goose legs and it was fantastic. We made slight adjustments to the proportions of Sriracha and honey because of our smaller batch, but WOW this one was amazing! Highly recommended.